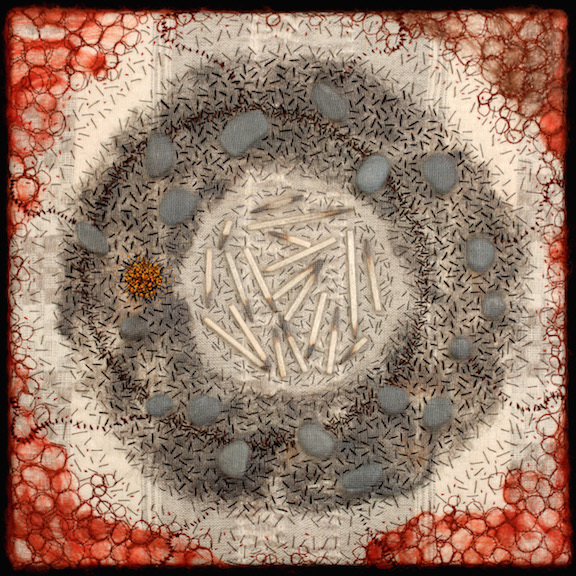 This work considers history, memory and the objects we revere, how the act of constant collecting coincides with an inability to release pain despite the body’s attempt to shed excess, regenerate, even heal. 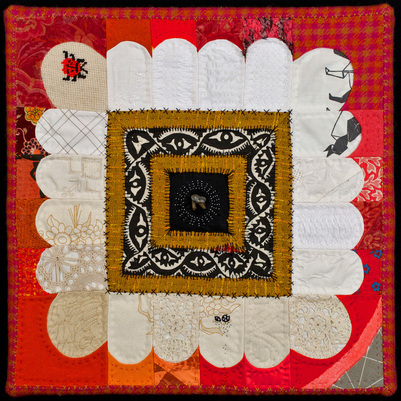 Here, the quilt form is the vessel for the tangible and intangible components of a life, couching themes of motherhood, family and loss with traditional stitching and handwork. 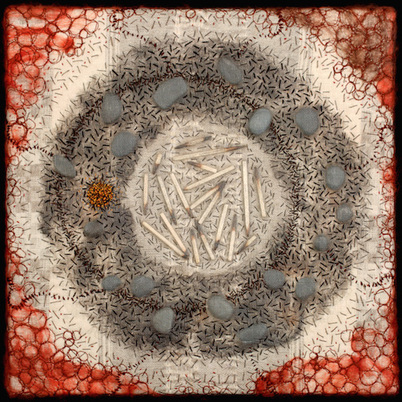 A “romance with the fragment” begins when our childhood pockets fill with relics from the natural world, and later, as adults, when we fill our most vacant spaces with the weight of the spiritual. The body is the ultimate reliquary for pain and loss; we are shaped and defined by what we cling to, despite its worthlessness. 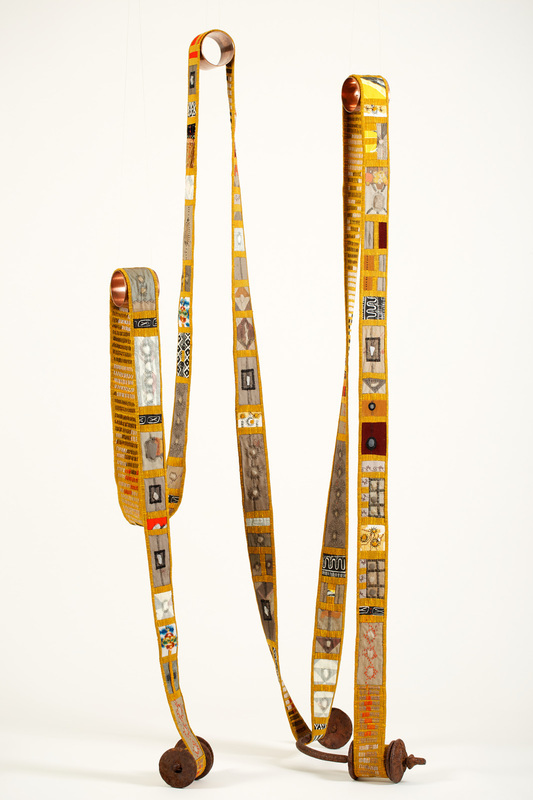 "Reliquary #8: Scroll" (3" x 325", installation dimensions variable) Vintage domestic linens & drapery, abandoned quilts & embroideries, silk organza, found objects. Machine pieced, hand embroidered, 2015. “Reliquary #11: Halo” (diptych, 22" x 20" x 2") Vintage domestic linens, wool, silk mesh, found objects. 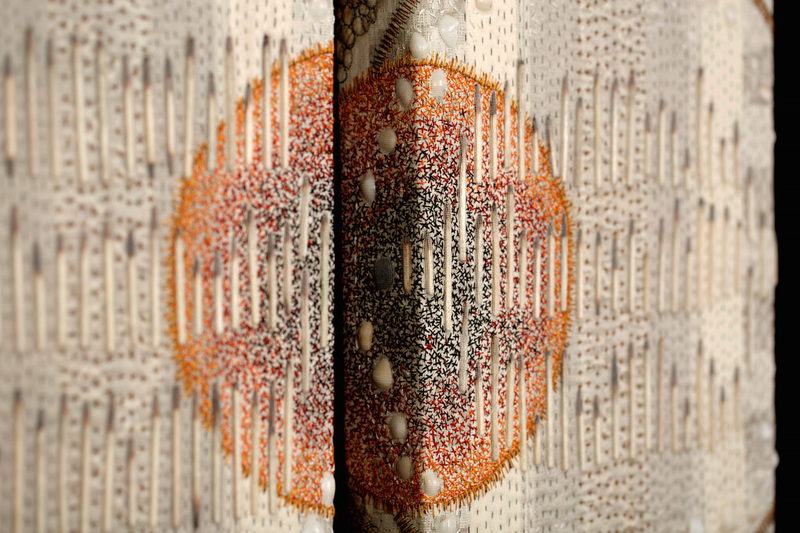 Machine & hand embroidered, upholstered onto cradled board, 2015. Alaska Contemporary Art Bank Acquisition, 2017. 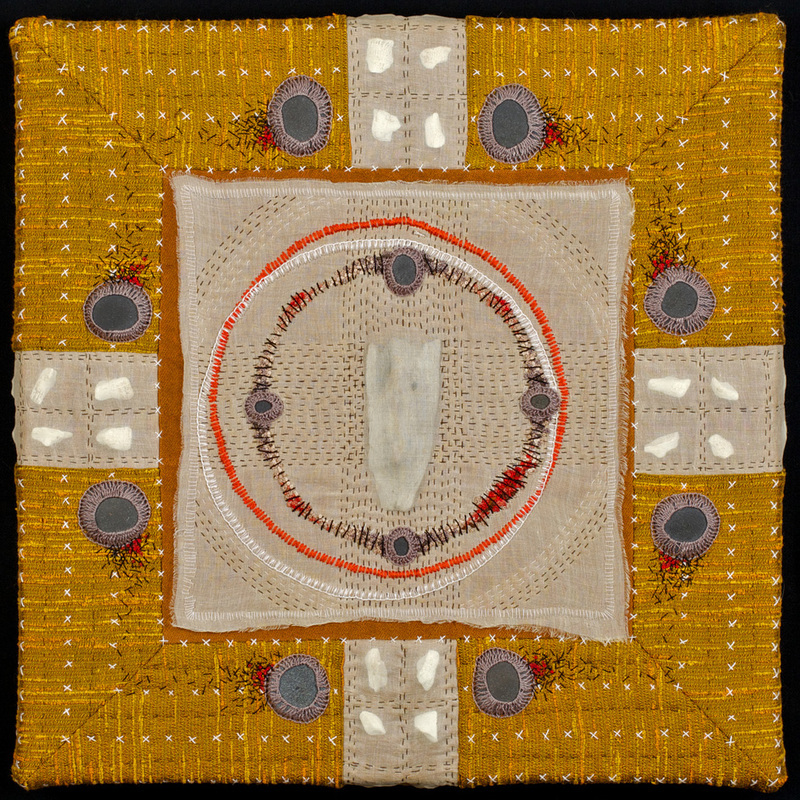 “Reliquary #12: Ichor” (16" x 16" x 2") Vintage domestic linens, wool, silk mesh, found objects. Machine & hand embroidered, upholstered onto cradled board, 2015. Private collection. "Reliquary #10: Corazon (10" x 10" x 2") Vintage embroidery, wool, silk, velvet, found objects. 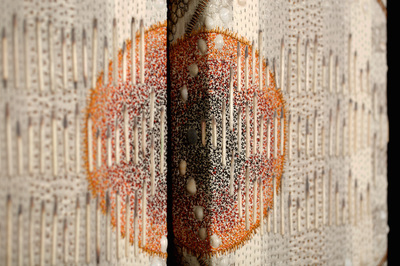 Machine & hand embroidered, upholstered onto cradled board, 2015. Private collection. 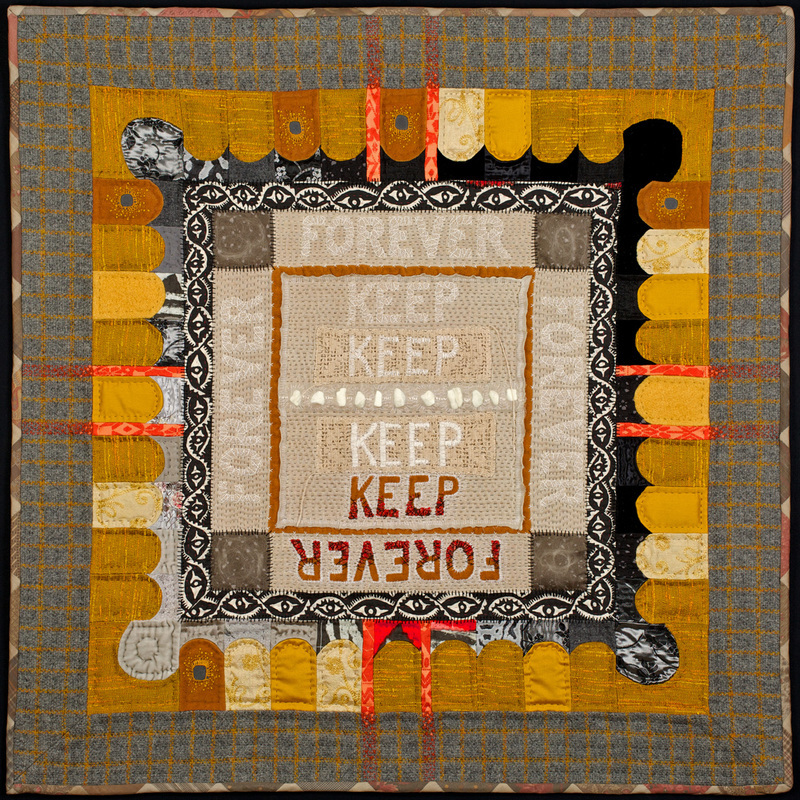 "Reliquary #5: Theft" (16" x 16" x 2") Abandoned quilt, cotton voile, vintage domestic linens, unspun wool fiber, found objects. 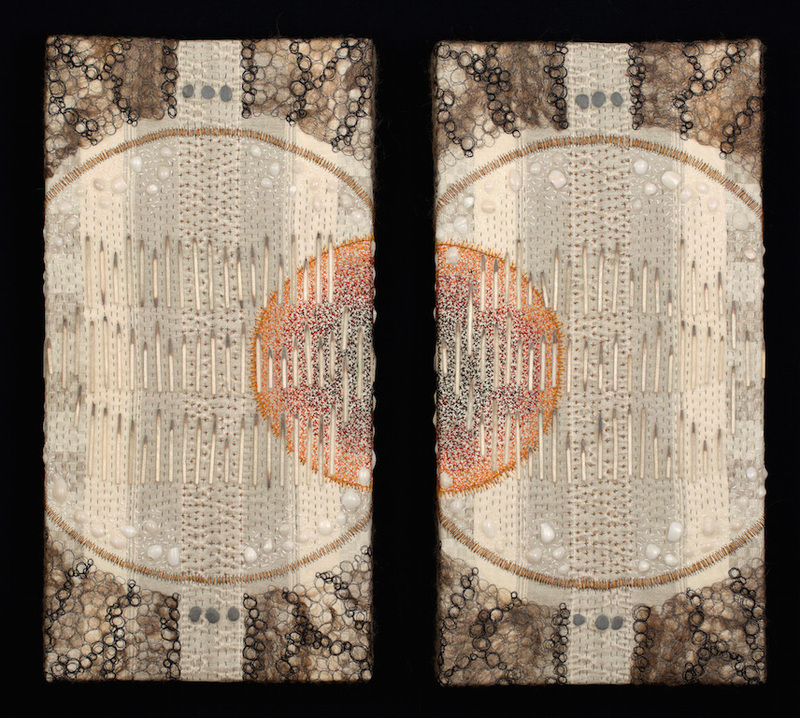 Machine pieced, machine & hand embroidered, upholstered onto cradled board, 2015. Private collection. 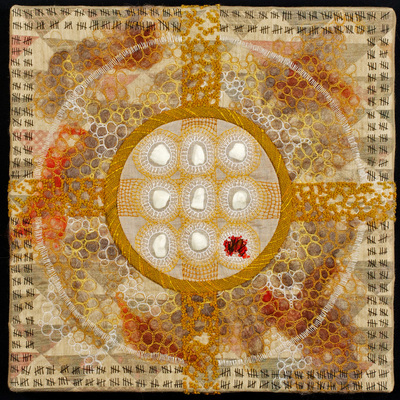 "Reliquary #13: Ring," (16" x 16" x 2") Vintage domestic linens, silk mesh, found objects. Hand embroidered, crocheted, upholstered onto cradled board, 2016. Private collection. 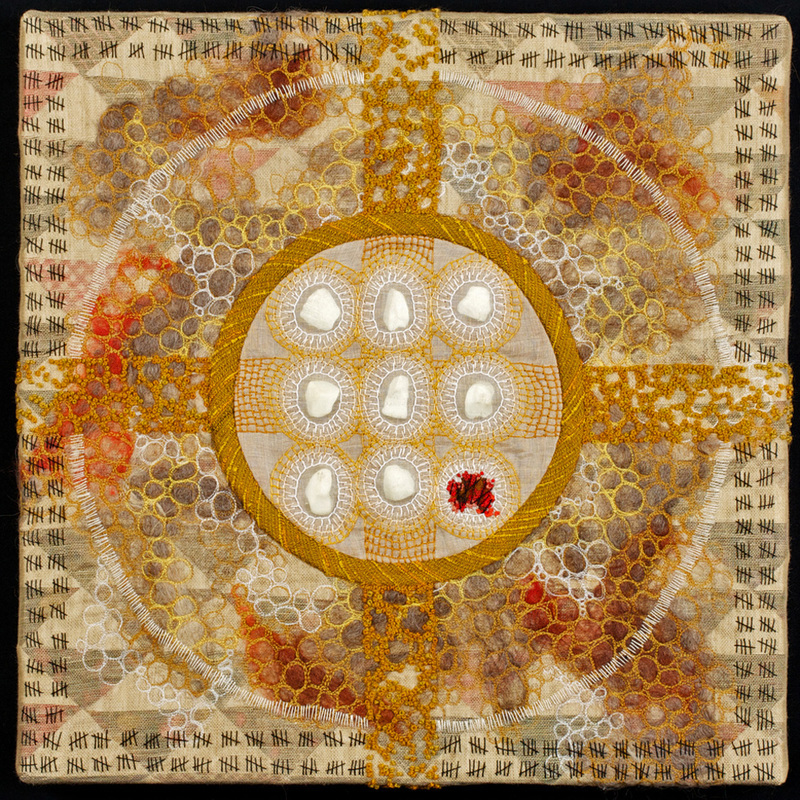 "Reliquary #9: Core" (10" x 10" x 2") Vintage domestic linens, wool, silk, found objects. Machine & hand embroidered, upholstered onto cradled board, 2015. Private collection. 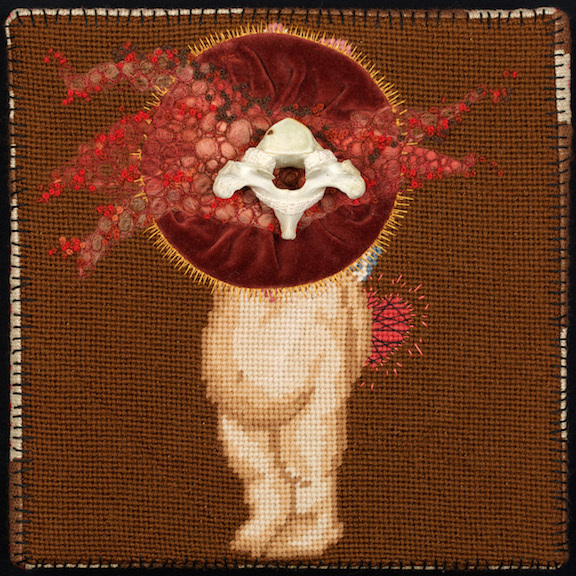 "Reliquary #7: Tooth" (16" x 16" x 2") Vintage domestic linens, cotton, wool, abandoned embroideries, silk mesh, found object. 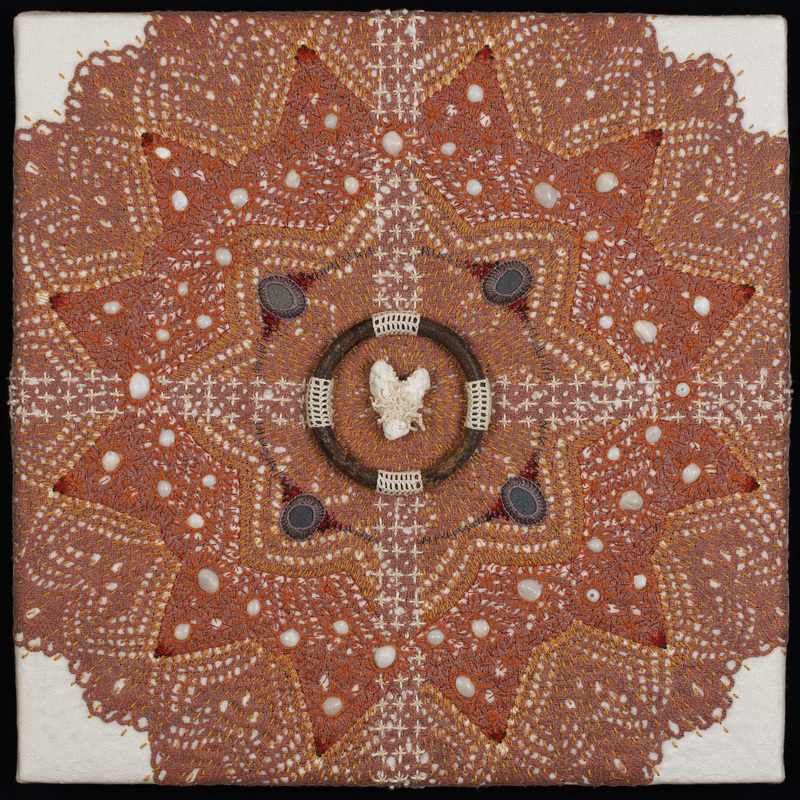 Machine pieced, hand embroidered & quilted, upholstered onto cradled board, 2015. 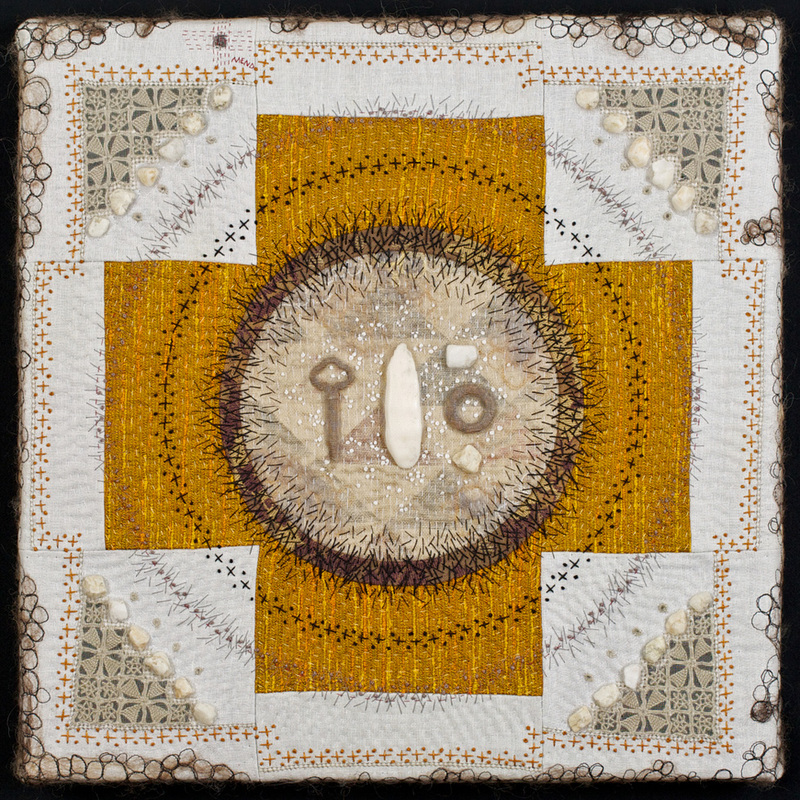 "Reliquary #6: Key" (16" x 16" x 2") Vintage domestic linens & drapery, silk mesh, cotton voile, unspun wool fiber, found objects. Machine pieced & embroidered, hand embroidered & quilted, upholstered onto cradled board, 2015. Private collection. 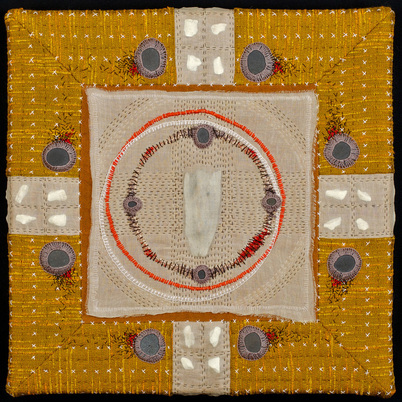 "Reliquary #4: Shard" (16" x 16" x 2") Vintage drapery, cotton voile, velvet, found objects. 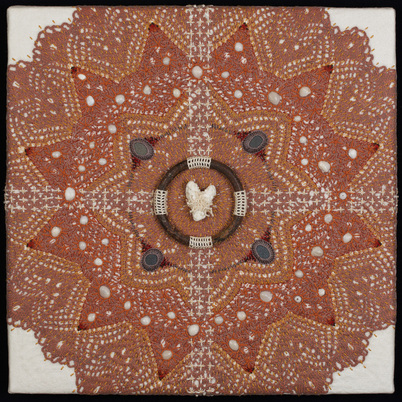 Machine pieced, hand embroidered & quilted, upholstered onto cradled board, 2015. Private collection. 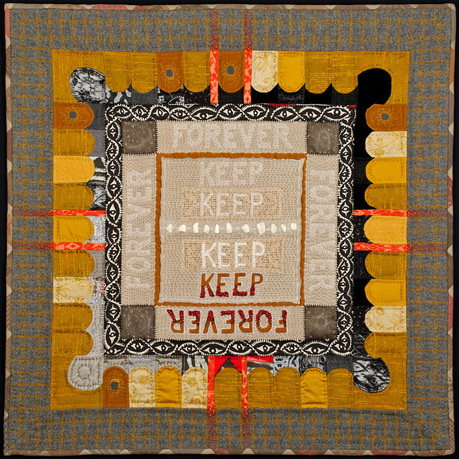 "Reliquary #2: Keep" (32.5" x 32.5") Wool, silk, cotton voile & velvet, vintage linens & drapery, hair, found objects. 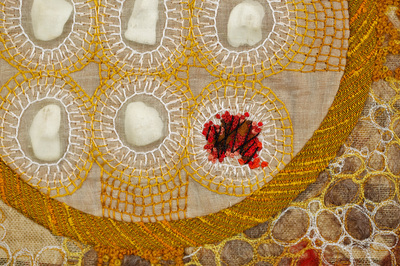 Machine pieced, hand embroidered & quilted, 2015. 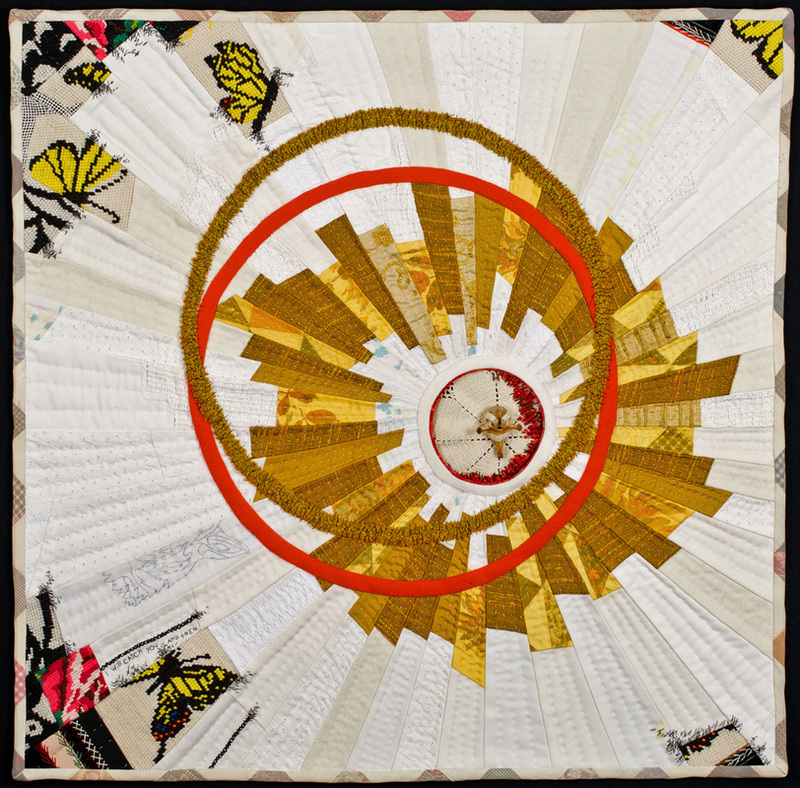 "Reliquary #3: Catch" (25.75" x 25.75") Vintage domestic linens, silk organza, wool, abandoned embroideries & quilts, found object. 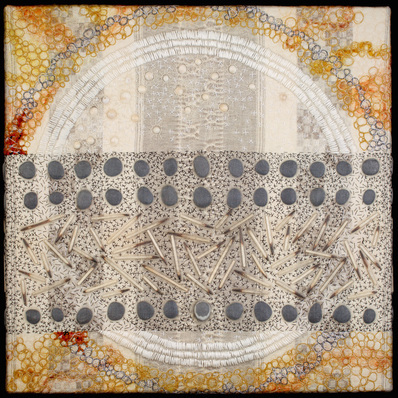 Machine pieced, hand embroidered & quilted, 2015. Private collection. 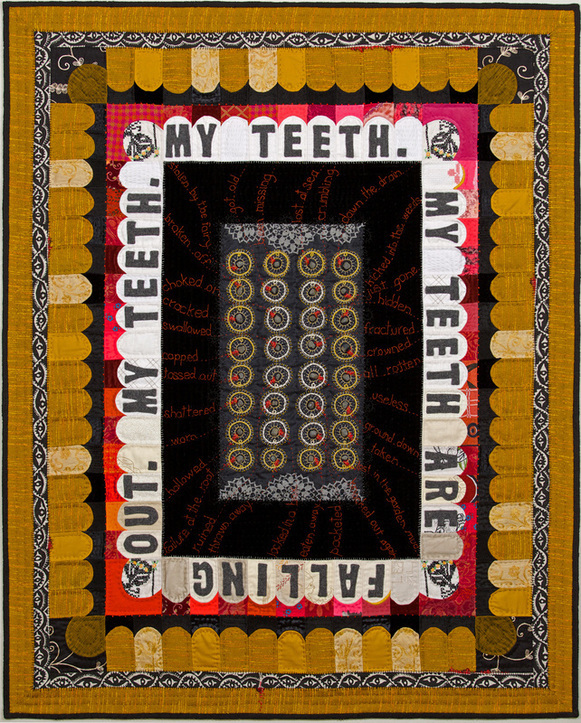 "The Acquisition of Language" (72" x 48") Wool, cotton, silk, vintage domestic linens, clothing, found objects. 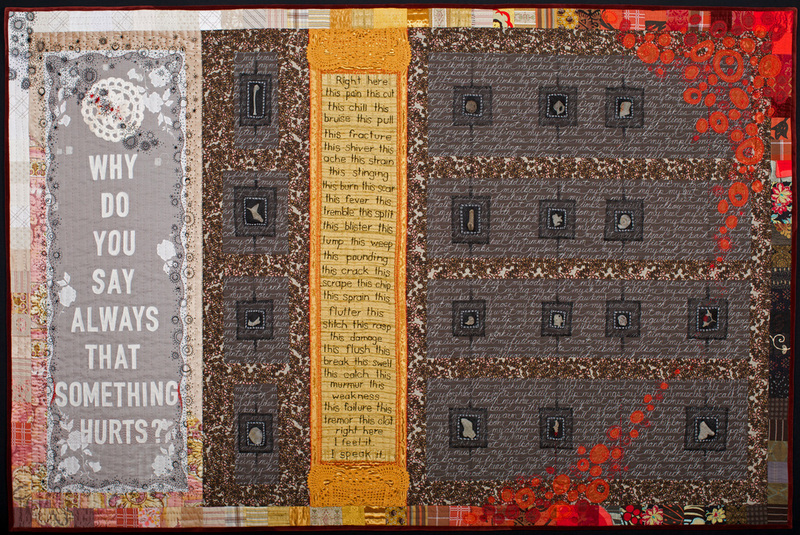 Machine pieced, free-motion machine embroidered script, hand embroidered & appliquéd, hand quilted, 2014. "Reliquary #1: Accumulation" (39.5 “ x 49.25 “) Vintage domestic linens & drapery, wool, cotton, silk & silk organza mesh, found objects. Machine pieced, hand embroidered & appliquéd, hand quilted, 2014. 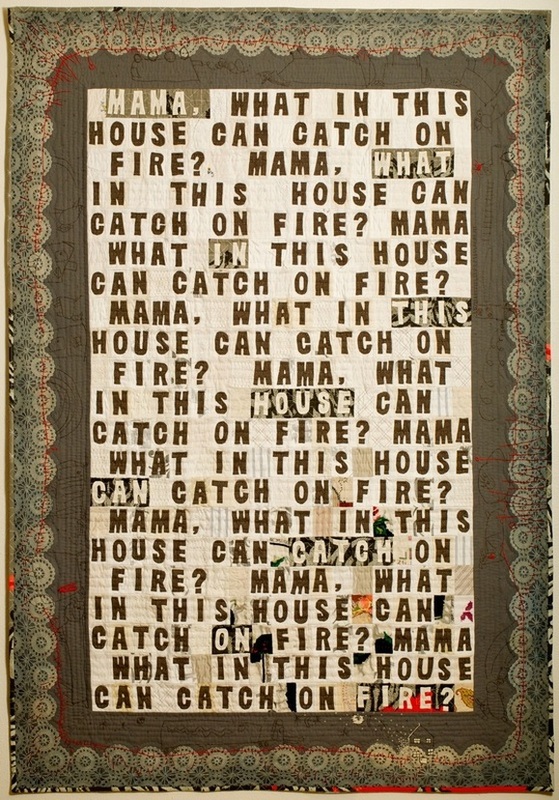 "Spontaneous Combustion" (54" x 77") Wool, cotton, vintage domestic linens. Machine pieced, hand embroidered & appliquéd, hand quilted, 2013. *Permanent Collection, Anchorage Museum at Rasmuson Center, Alaska. "The Fragile Domestic" (30" x 30" x 3") Vintage quilt & drapery, clothing, found objects. 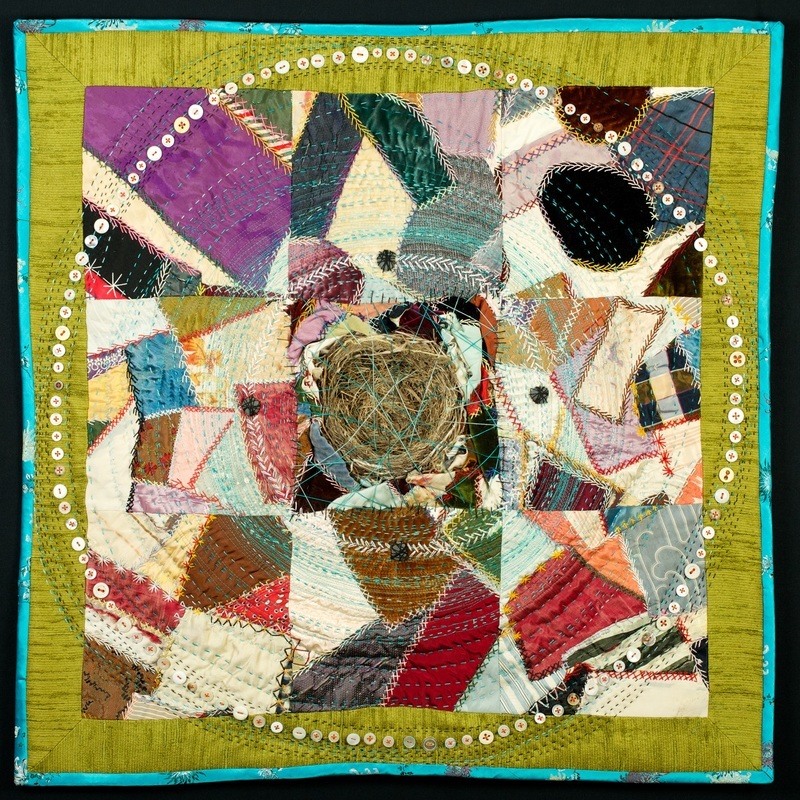 Machine pieced, hand embroidered, hand quilted, 2014. Private collection.